Very rarely do I find people who do not have an opinion on dog parks. More often I find people who are on either side of the debate. People seem to love them or hate them, but I am going to say something shocking and say I am in between! “What? !” I can hear you all saying that through the computer and probably using some language that shouldn’t be repeated in this blog, but I hope you will let me explain why I feel this way. 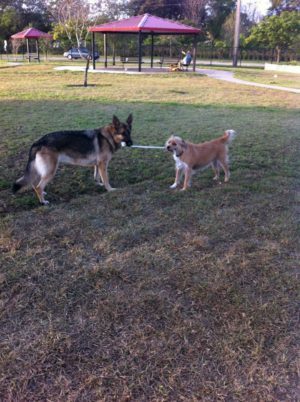 I love dog parks for one reason and one reason only….they are the best place to show a reactive dog how to just watch other dogs off leash. I mean I can have off leash dogs at my home and facility, but I can never get the amount of dogs that some dog parks get. 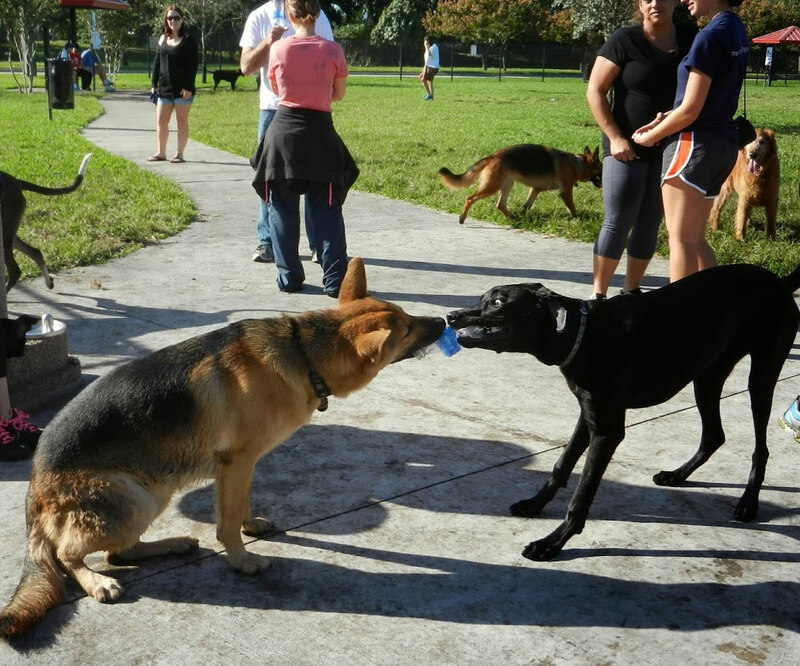 On a good day upwards of 40 dogs can be at a dog park and while it might be a little overwhelming for a dog, it is wonderful to expose them to other dogs in a safe way where the dog I am with can begin to feel comfortable just watching other dogs, not growling, not lunging, not barking! Certain parks that I frequent are monitored by law enforcement to make sure people are doing what they should be doing….on leash outside of the dog park and off leash when inside of the park. A lot of people forget that many dogs are not comfortable around other dogs so they think that it’s no problem that their dog runs off leash to the car. Well, it is a problem and it’s nice to know my neighborhood and city care enough to constantly monitor and enforce the laws that keep everyone safe. So, now all the reasons I tell my clients to stay away from dog parks! The biggest reason I say stay away is because dog fights happen all of the time! I am not kidding, just the other day I was at the dog park for 20 minutes and during that time three separate fights occurred. Two were mild and nothing significant happened, but one, it was pretty bad. I knew as soon as I heard it. You know that saying that “silence is golden” well at a dog park that is not the case. When I don’t hear the dogs involved making sounds, to me it’s the worst case because that means a bite is happening and the dog is holding on and that is exactly what happened in this case. To make things worse one owner was on the other side of the park…that’s right not anywhere close to their own dog and had to run like 100 yards to get there. The damage though was done and one dog had a very ugly gash in its neck. Off to the emergency vet they went, since it was 6:30 am and no other place was open. What happened before was, of course the blame game and the yelling and screaming. When bad things happen why can’t people take blame and try to fix the problem? Why do people always have to make it worse? It helps no one and just continues to upset the already upset dogs! I’ve also seen more humans get into fights at dog parks than anywhere else…..do you think it’s because I spend more time there than out in public? LOL! I saw two 50 something men throw punches at one another for some reason or another while in the park. Of course it probably had to do with their dogs, but who knows! Dog parks can bring the worst out of humans just as much as dogs, so be careful if you decide to go to one! Most people vaccinate their dogs and take care of them as much as possible to make sure their pets are safe around other things, people and animals, but in many cases people don’t. Which is why health is another reason I say stay away from dog parks. People could be financially unable to vaccinate or treat their dogs, but it is often for another reason entirely. Too many people have told me how their dog got Giardia or Hookworm because of the dog park and how much of an expense and hassle it was to treat. So, if you are at all worried that this is a possibility were you go, then I say just don’t. The risk isn’t worth it. Always remember one thing….if you feel you need to socialize your dog with other dogs it is wonderful to schedule play dates with friends or family whose dog[s] you can trust to interact nicely and safely. Always put your dog’s well being first!